Behind a beautiful red door is the home of Rebecca & Gautam, reunited at long last. Their relationship was tested, questioned and faced with unexpected long distance but nothing could separate them. Our relationship began in 2012, we met through a mutual friend after hearing a lot about each other, Gautam contacted me via Facebook. He was living in a neighbouring town, we went for date in a village nearby. From that day until the day he had to leave the U.K., we saw each other everyday. We were so in love. We were both so happy and busy, working and spending time together. When the visa rules change, meaning that he had to leave the country to apply for a new visa, we were devastated. We woke early and went to Edinburgh, from there Gautam would get the train to London and fly home. We enjoyed every minute of that last day. We enjoyed it so much that we lost track of time and forgot to buy suitcases for Gautam’s new clothes, we had to beg a shop to open their doors and let us in to buy some and then we nearly missed his train to London! When he got on the train, I didn’t want it to move, the train conductor was blowing his whistle at me, telling me to move away from the train trying to leave. I was in floods of tears, I couldn’t believe this was happening. I dropped to the floor, we didn’t know when we would see each other again. Two days later my Indian visa arrived in the post, so I booked my ticket to India. As the news of my trip spread, I lost a lot of friends. The sad part of intercultural relationships, not everyone agrees and many people question your love. The negative comments wouldn’t stop me, I was doing what I wanted for a change, for happiness and love. My mum was my rock during this time, as I watched relationships around me break down, she was there beside me. I left for India alone, a very scared girl. My visit to India was great, those memories will live with me forever, I spent three weeks with my husband and in-laws. There were still difficult times, language, cultural, religion, jealously, touching the feet of elders, the water spray in the toilet, squat toilets, bucket showers and only eating vegetarian food. At that time, I knew nothing about Indian culture or traditions. Our wedding day was perfect, I truly felt like a Gori Rani, my lehenga was beautiful and the long week Vermont was amazing. I didn’t plan any of it, I hadn’t a clue of the traditions, Gautam and Daddyji organised it before I arrived. I know one day I will plan our British wedding which will be more my day, I see our Indian wedding day as Gautam’s day. In India, I had a normal family where two parents lived together, with lots of love to give. This was really special for me, coming from a broken family. I returned to the U.K., miles away from my husband and my new family, I was heartbroken. 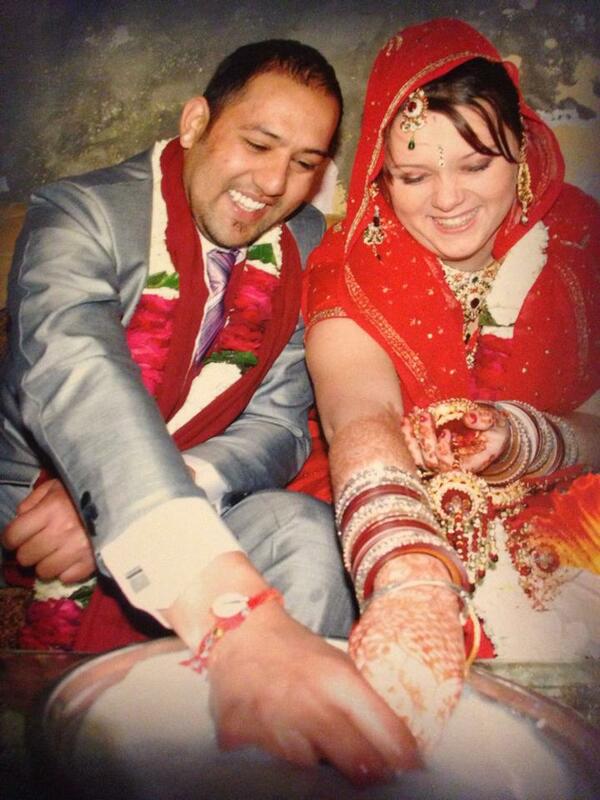 The new visa rules hit us again, for Gautam to be granted a spouse visa, I needed to earn £18,600 per year. I was a student working part-time, not earning anywhere near that amount, and if I were to leave college I would be working for minimum wage, still not earning enough. It got too much, so I left my job to focus on college so I could get a good qualification and start earning decent money. Three weeks later, I couldn’t stand the distance anymore, I booked a ticket back to India. Life in India was good, temperatures were high and our love grew stronger. When I returned to the U.K. a second time, I gave college another go and we didn’t see each other for over a year. It was a difficult year, but I made new friends, friends who supported my intercultural marriage and who were happy for me. This time I was determined to complete my college course, I used the pain of the distance to drive me forward and motivate me to work harder. I never chose to be in a long distance relationship, it was overwhelming to be so far from the man I love. We survived with persistence, dedication, broken FaceTime calls, costly phone calls and most importantly with our love. I took an au pair job in Ireland and we started to plan his visa file, it wasn’t easy and Gautam did the majority of it, I helped him with the legal things and certain laws. We kept it a secret, just incase new issues arose, we were scared. Thankfully, his visa process was straight forward, he was granted his visa, I was over the moon and extremely impatient. When in a long distance relationship arguments are difficult, you can’t kiss and make up, you just have to forget and move on (my impatience caused many arguments). He finally booked his ticket to Ireland, I was so excited. It was so hard to keep my mouth shut and people started to guess he was coming! Gautam first flight was cancelled, so yes, more waiting but it was so worth the wait, all the long distance pains were over, he was finally coming! Waiting for Gautam at the airport was everything I had dreamt of. I wore a traditional Punjabi suit to Gautam’s surprise, he loved it and so did passersby. I had many comments of how beautiful I looked and I even made one woman cry after telling her our story. When I looked through the double doors, there was my man, looking perfect. I ran to him and gave him the tightest hug, I burst into tears while he comforted me telling me everything was fine now, we were together! My dream comes true! Life has never been better, we moved into our own home where we can cuddles besides our open fire, behind our beautiful red door. When you want something and know it’s worth it, you will fight for it, in my case it was love. I’m a lover not a fighter but I will fight for what I love! Awwhh that just made me cry and she is such an inspiration. God bless her for staying so strong and for not giving up on her education etc. Wow! Hi Lauren, your blog is like a newspaper for me now! Everyday new story. I would like to hear about intercultural relations which have not worked out. This can provide a broader view of this new concept of relationships. Yes, I am waiting for someone to contact me regarding one of those. Obviously not many people want to share their heartbreak. But there are many cases where intercultural relationships don’t work out for various reasons. Wearing a traditional Punjabi suit for her airport reunion with her husband… bless her little heart. No wonder her story made a lady at the airport cry. Intercultural stories are not the only hard ones,in india,inter caste and inter state marriages are themselves intercultural,inter ethnical,since it is such a big country,people are so different! You are write. I have seen it first hand. Hi Lauren. I’m still typing. It’s outrageous that the UK Government can stop two people being united because one is not earning enough money. Cut the benefit somehow but don’t stop them from being together if they’re married and genuine. It really is disgusting. The reason of course is all the abuse and fake marriages in the past. I’ve known so many. The genuine people are the ones to suffer now. Yes! It’s very sad indeed! !